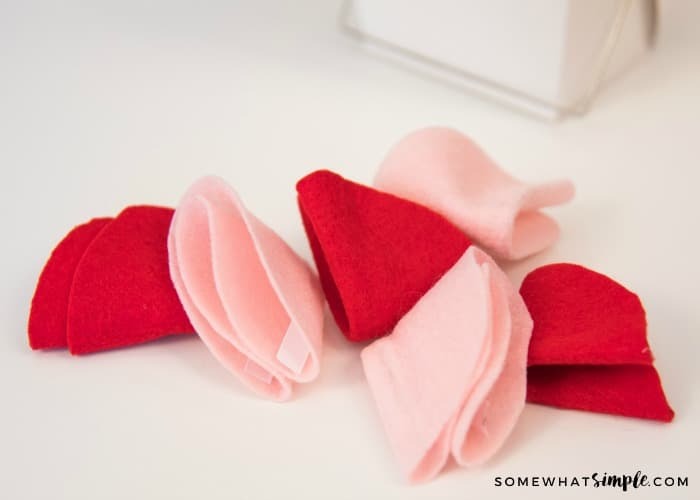 Fill these felt fortune cookies with special “love coupons” for your sweetheart, or fun activities for the kids! 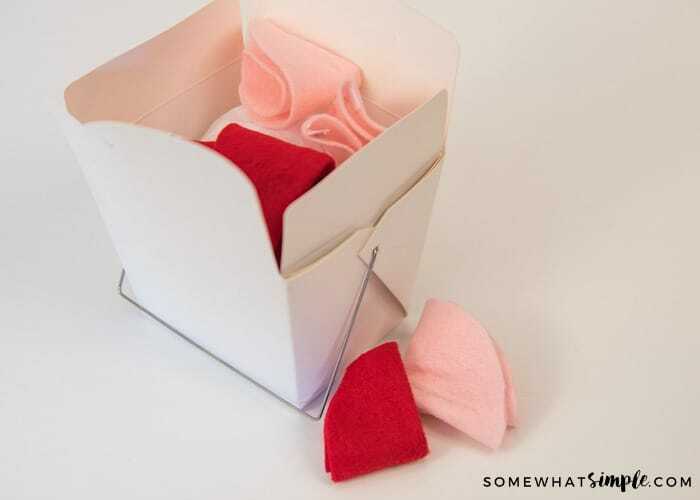 I first made these felt fortune cookies several years ago as a Valentine’s Day Gift for my husband. I filled each cookie with a strip of paper that had a short love note on it, or a service coupon he could redeem at any time. It was a thoughtful gift that was super simple to put together! Over the years I’ve come up with some variations to this idea and I’ve soon discovered they can be used for literally any holiday and any activity! One of my favorites is to put strips of paper on them with chores for the family. After dinner each person picks a cookie and they have to complete that assignment as part of clean up – clear the table, rinse the dishes, sweep the kitchen etc. It’s amazing how much less fighting and eye rolling you get at chore time when you try to make it fun! felt – use any colors for any holiday or celebration! circle pattern – this can be as big as you’d like. I used a lid from my pantry that was about 4 inches in diameter. Trace your circle onto the felt with your marker and cut it out. Cut a ribbon just shorter than 4 inches and a piece of wire just shorter than that. Put a line of hot glue on the center of your felt and then place wire over the glue. Cover the wire with ribbon while the glue is still hot. Lay your notes/coupons in the center of the circle, folding as needed to make it fit. And you’re fortune cookies are made! It is written in the stars. You will soon be served breakfast in bed. The planets are aligned, and their energies will present you with the chance to receive a foot massage from your wife. One who loves you will serve you your favorite dinner. Lady Luck is on your side! The back rub you have been wanting will finally happen this week. Tap into the extra ounce of energy you will receive from Jupiter this month and get ready for a fun date planned by your wife. Pisces has granted Taurus one chance to get out of changing a diaper. Super cheesy, I know, but I needed something “fortune cookie sounding”! 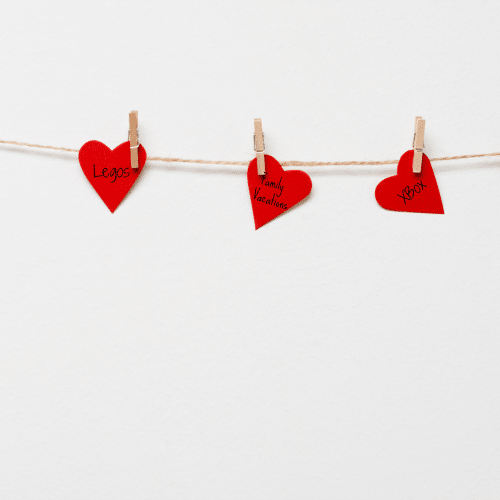 Another fun idea for your family is to use the activities we shared in our Valentine Countdown. This post originally published on Somewhat Simple in January 2010. 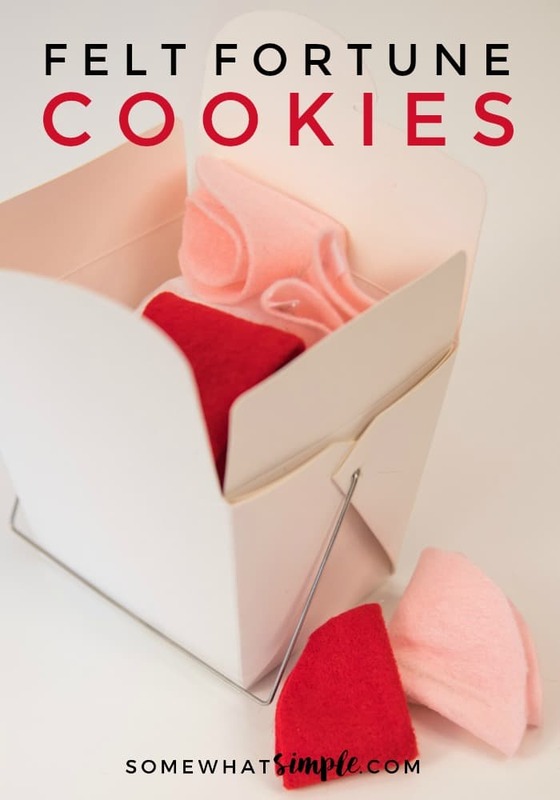 I love felt, and to make Valentine's fortune cookies? Brilliant! Thanks for linking up your victory for VOTW @ Design-Aholic. Make sure to come back again, I can't wait to see what you have next! Oh my goodness HOW CUTE! I can't wait to try it! This is one of the cutest and most creative ideas for Valetine's Gift's I've ever seen. I think I'll give a box to my (single) sister. These are super cute! Thanks for another great idea! I really love these, and now sewing. I can't sew at all. I LOVE this!!! 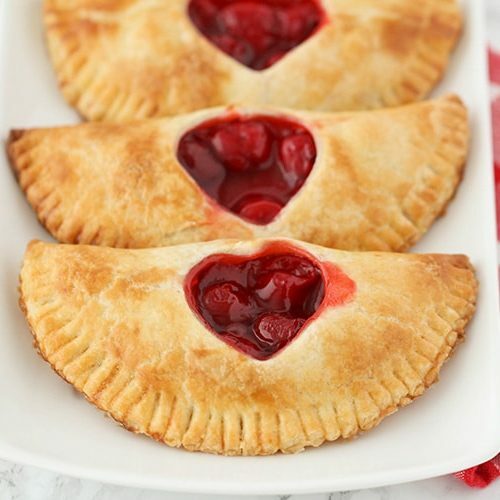 SO easy to make, too!! OOh I love it. No sewing! I am a new follower from Follow Friday. What a great way to find amazing new blogs like yours! I look forward to reading more! I love this idea!!! I will be trying this. I found you on the follow friday link and so glad I did. I love the fortune cookie idea this year! Yours turned out darling! I saw on Skip To My Lou a link to Alpha mom on how to make your own cookies. The recipe is adapted from Paula Deen. The kids and I are going to make these for teachers, bus drivers, etc. with personalized messages. Such a fun idea! So incredibly cute!! Love it! I'm a new follower from "Friday "Follow"! I'd love for you to come visit me! Brilliant idea you've got there! Here I am…your newest blog follower (No. 901)! Thanks for linking up at Friday Follow. Happy escapes! Hi, I was already a follower but it must have removed me. So here I am again. LOL Stopping by from Follow Friday. Always love your posts! A girl can have so much fun hanging out here. See you again soon. What GREAT ideas you have. I found you through TrendyTrehouse's blog on the Follow Friday event. 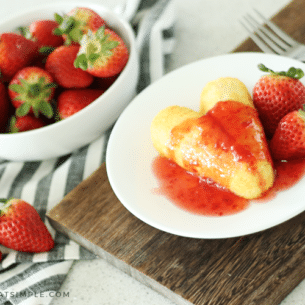 I hope you don't mind but I put a link to all your Valentine's ideas on my blog (WalkinInSunshine@blogspot) down towards the bottom of the page under the Valentine's gift ideas. I hope I send some traffic your way, I'll be back and may even post my tries at these on my blog-giving you credit of course. I am so glad you posted this and I saw it – I absolutely have to do this for my husband! Thank you!!! These are so great! I made them last year for my son's class for his Valentine's. I used a pipe cleaner instead of the wire and filled them with Hershey's Kisses!